Well, it's finally come - the day when the latest Gamache book is out - and in your hands....and in your heads! I honestly cannot thank you enough for walking this exciting path with me....all the bumps and hills (often of my own making) - and all the fabulous events along the way. I know many of you followed the creation of A TRICK OF THE LIGHT as I wrote it last year. My frustration at times - my fear - the exhausting and exasperating times...but also those moments when I knew I was on the right path...often it was something as tiny as a turn of phrase. An insight. A moment of inspiration. A pastry. Then the editing - the four, five drafts, as the book was shaped, as more life was breathed into the characters. And now - today. they've left my home and come to yours. And you, with your imagination, lift Gamache and Jean Guy and Clara and ruth off the page. Yesterday, in Toronto, I did the Proust Questionaire for the CBC national radio show, The Next Chapter, with Sheila Rogers...8:30am in the studio. Then hopped a flight to Boston. 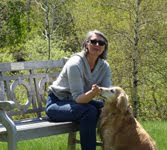 ginny met the flight and we drove together to concord, New Hampshire for the US launch of the book. Fortunately this part of New England hasn't been too badly hit by Irene - though many places were without power for days - and many places still are out. And poor Vermont. Dear God. We watched it coming...and the forecasters in vermont and newscasters preparing people for terrible flooding. And that's what happened. But worse than many people could imagine. Whole communities surrounded by flood waters and cut off. Tens of thousands without power - and perhaps not back for many days to come. We hope not. A day or so is inconvenient...more than that and it gets life threatening. If you live in Vermont, and can read this, please know you are in our thoughts. We're watching and caring,.,.,and rooting for you! And if any people can rise above it, and help each other out, it's Vermonters. Remarkable, resiliant people. Indeed - a few stores I'm going to are struggling with getting power back on, and Ginny and Sarah trying to figure out safe routes past flooded roads, to get there. But we;re all determined...if the stores still want us. Ready or not - here we come!!! And I hope you can meet me at RJ Julia in Madison, CT on Thursday night - and then the Norwich bookstore, in Norwich, VT on Friday. Tonight, it's Kennebooks, in Kennbunk, Maine. See you there. So far the events have been amazing! 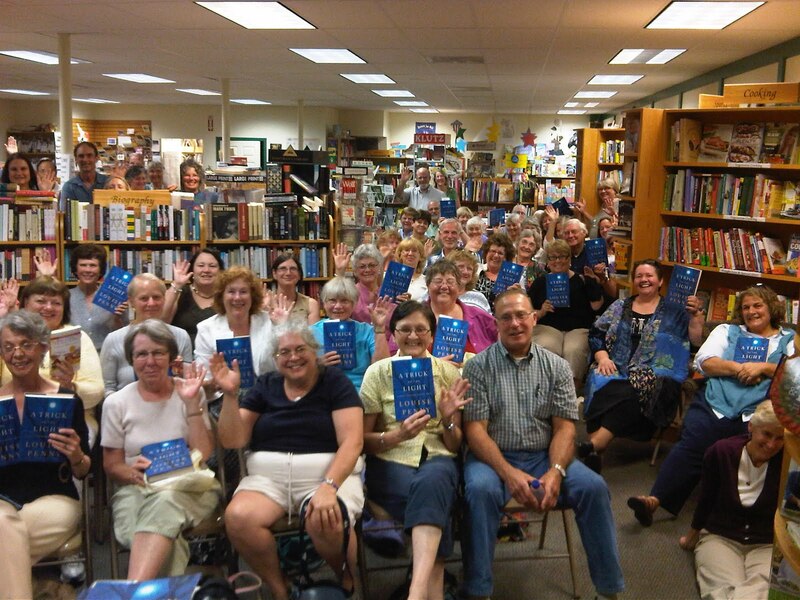 More than 100 people last night at Gibson's Bookstore in Concord. you can see the photos. Such fun! And, on a night when the Red Sox were playing...(not well...) We had just a blast. thank you for coming out and celebrating the US launch of the book. AND - when I arrived at the hotel (the Centennial Hotel - fab!) what did I find? Three packages from the publisher....you can see the photo, after I ripped them open. 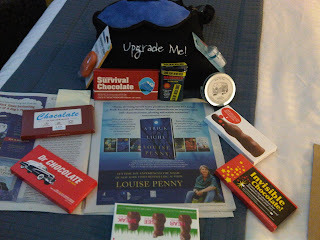 A care pack with flight blanket, laundry soap etc...six bars of emergency chocolate (well...five now) and....and....can you make it out in the photo??? A copy of this coming weekend's NYtimes Book Review section....and the full page ad the publishers put in for A TRICK OF THE LIGHT!!! It's magnificent. I was breathless when I opened the package. I never dreamed this would happen. Minotaur Books is just the most wonderful, thoughtful, brilliant imprint. Wow. I'm keeping it safe, and having it framed as soon as I get home. I feel as though I've walked (flown) into a dream. So beautiful. I hope to see you on the road - it would be a great pleasure to shake your hand and thank you for your support, and sign your book. Mostly, of course, I hope you enjoy A Trick of the Light, and the company of friends. 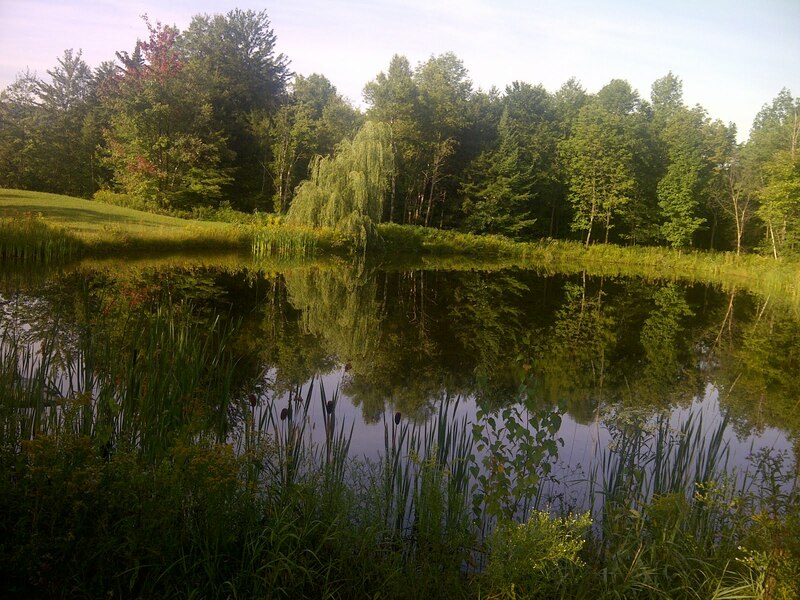 the other photo was sent this morning by Michael - the pond at the guest cottage - he and trudy on their morning walk. I miss him so much. But lovely to see the picture and feel I'm on the walk with them. Thank you for coming along on the tour. So far, it is absolutely amazing! Arrived by train last night - up early. Had interview with Mark Medley, books editor of National Post this morning - he brought a photographer...thank God I brushed my hair! Then lunch with the terrific Raincoast publicist who is putting all this together and 'wrangling' (though thankfully not branding me) through the day. Supposed to have an interview with the Globe and Mail but that is being rescheduled. Off to sign books soon, then the event tonight at Sleuth of Baker street. Their new address: 907 Millwood Rd - 416-483-3111. Party and signing starts at 6 and goes to 7:30. Then off to Boston tomorrow and being met by Ginny, who'll drive me to Concord, NH and the official world launch at Gibson's bookstore. So far, so good. I find a lot of book tour is remembering it's a marathon not a sprint. So, trying to conserve energy, while still being present for everyone - and enjoying myself. I actually love the events themselves, frankly it's just the traveling that I find draining. Michael kept in touch all yesterday, knowing how worried I was about leaving him with the storm. And what a storm! Not so much the winds, thank heaven, but a deluge of rain. More than 100 millimeters - almost four inches. Vermont, of course, got pummeled. Dreadful. They've had such a difficult few months with flooding, and now this. We love Vermont and Vermonters - being so close physically makes us feel close emotionally too. Very upsetting to see video of the waters. Michael lost power (or the house did) at about 4 yesterday - after it flickered on and off all day. In fact, hundreds of thousands in Quebec were without hydro (what we call power, since our comes from water power). So he went to bed early, thinking it wouldn't be on for a day, maybe more. Happily, and amazingly, it came back on at 8:30. I find it both comforting and difficult to write about Michael and home. I feel so close to them, and miss them so much, and long to be there. And yet, I'm so happy to be on tour too. I know this will get easier as the tour progresses....and then get harder again as I near the end and can 'see' them. Just one foot in front of the other.... And how lucky am I that even if I'm sad, I get to open a door and see your smiling faces. The great photo at the top was taken by Danny at Brome Lake Books on Saturday night. Hope you like A TRICK OF THE LIGHT. I can't believe the day is finally here....well, just hours away. Watching progress of Irene. New York city has shut down the transit and the airports. Looks like less damage will be done than feared, thank God...but it's still going on and heading up the coast. The worst hit for Canada apparently will be parts of New Brunswick and ... Quebec's Eastern Townships. Not as a hurricane, but huge rains. Warnings out....more than 50 millimeters expected. I'm in Montreal and heading to Toronto this morning, so it's not an issue for me personally, but Michael will be in the worst of it. Filling the bathtub in case electricity goes out. Candles and flashlights ready. Food in. I wish I could be there with him. I know he'll be fine - everyone will be if they stay off roads etc - but I'll be happy to hear from him tonight when it's over. 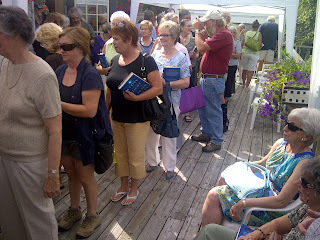 But - enough of Irene....I want to tell you about the pre-launch party yesterday at Brome Lake Books. it was phenomenal! Hundreds of people showed up! They ran out of books - and they had more than two hundred to hand out to ticket holders. They also (perhaps less surprisingly) ran out of wine! Lucy's father had to run to the Societe d'alcols to get more. It was such fun! An absolute 'slam' of people. I signed straight, without a break, for two and a half hours...and could not be happier! Danny and Lucy worked like maniacs, and Lise, God bless her, leapt in and wrote down people's names to put on post-it notes on their books before they arrived at me - made it go faster...and I have a tendency to forget the names of even close friends in crowd scenes. I think it's a form of social anxiety. It's happened at my own dinner parties when I introduce guests. Ugh. Michael took all the photos...the man taking the picture of Michael taking the picture is Lucy's father, John. Michael is standing right behind me, as I say a few words. I wanted to share this fun event with you. 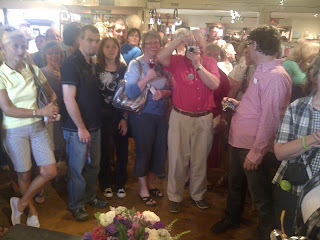 and if you were there - thank you so much for coming out to celebrate! Having the support of my friends and neighbours means the world to me! After the event Michael and I said goodbye - oh dear - then I drove in to Montreal. Off by train to Toronto this morning. Hope to see you on tour! Next event is tomorrow night at Sleuth of Baker Street, in Toronto. Then the offiical World Launch for A TRICK OF THE LIGHT at Gibson's bookstore in Concord, New Hanpshire. I see Irene is bearing down on Concord - please look out for yourselves.... see you soon. 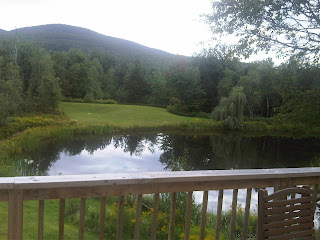 Perfect morning - we're sipping cafe au lait and sitting in the sunshine in the cottage - and watching coverage of Irene....and like millions of others, keeping our fingers crossed. Jack Layton's funeral is today. Lots of people lining up. It'll be televised live across Canada. But I won't see it - it's happening at the same time as A Trick of the Light pre-launch party at Brome Lake Books at 2pm. I'm so glad it's a state funeral (quite rare in Canada) and is being televised. He deserves that. 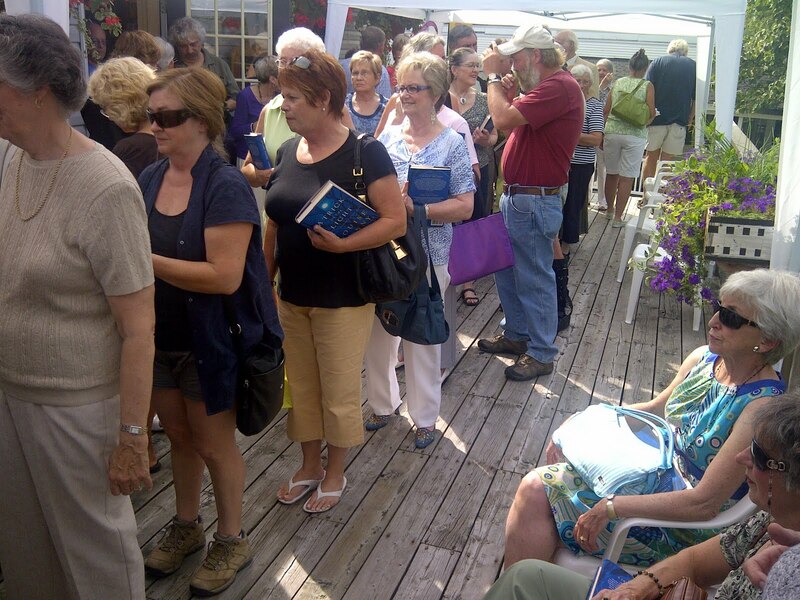 As I say, I'll be at Brome Lake Books, celebrating the launch of the book! And so looking forward to it. We ended the BURY YOUR DEAD tour with an event with Danny and Lucy at Brome Lake Books - and now we're starting the next tour there. 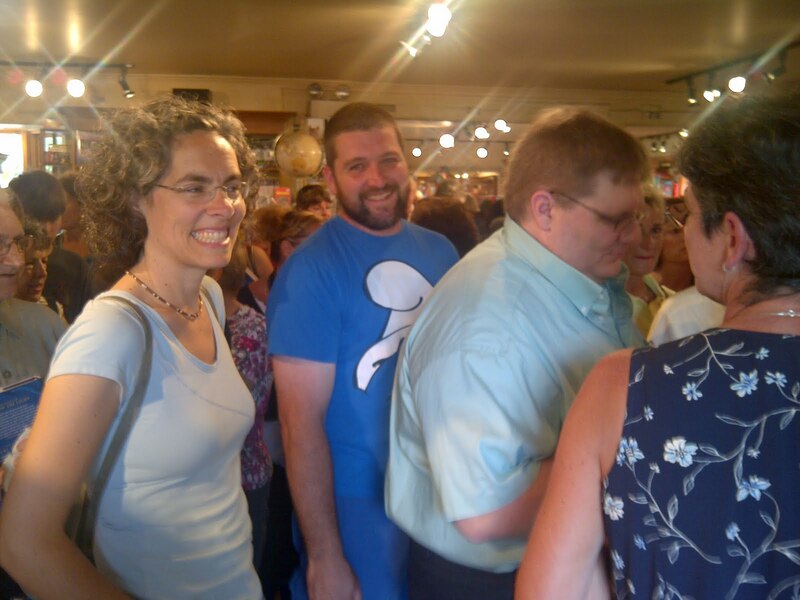 They really are a remarkable couple, great friends, and brilliant bookstore owners. Danny and Lucy have arranged for a local artist to create a painting of the launch, at the launch! How brilliant is that!? her name is Shannon Brown....and they'll be auctioning off her painting at the end of the event, to raise money for the Yamaska Literacy Council. If you're in the Knowlton, quebec area, come on by - for drinks, food, a signed copy of A TRICK OF THE LIGHT, and bring your cheque book to bid on Shannon's painting and raise money for literacy. How wonderful Shannon is to do this! And Danny and Lucy for thinking of it. 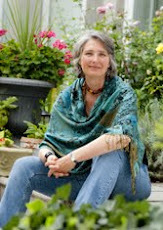 Lise will also be there - as will Michael, of course. They'd love to meet you too. Then - driving in to Montreal this afternoon - and hopping on a train first thing in the morning. Rainfall warnings for Townships and Montreal- for tomorrow. Irene. Fortunately for me, I'll be skiddadling out of here just ahead of the storm. To Toronto - for a bunch of media interviews Monday - then another pre-launch party at the new Sleuth of Baker Street - 6pm Monday. Then flying to Boston Tuesday morning, for the official world launch at Gibson's Bookstore in concord, New Hampshire Tuesday night at 7!!! I mention all this because while I plan to blog and facebook post throughout the tour, the fact is, it will be very hectic and i'm not sure when i can blog again....But I'll do it as often as possible, because I love keeping in touch with you. And you've been so supportive through the writing of the book - and all the dreams and hopes, and fears. It means a lot to me that you also get to celebrate and be part of the tour! Speak to you as soon as I can! If you're in Irene's path - please look after yourself! Five days to the official World Launch of A TRICK OF THE LIGHT!!! Pre-launch party this Saturday at Brome Lake Books in Knowlton. the book won't be on sale or on the shelves, but if you buy a ticket to the party (which starts at 2pm) then you get a copy of the book on Saturday. And I'll be very happy to sign it! then, in toronto on Monday at 6pm, I'll be at the new location for Sleuth of Baker Street for another pre-launch party. We're watching Hurricane Irene, as are most people along the East Coast. If you're in the area, I hope you're safe. Unbelievable winds. I was slightly nervous that I'd have difficulty flying from Toronto to Boston on Tuesday because of Irene - but seems it will hit Sunday/Monday in that area. so while I'm somewhat relieved for the tour schedule, I continue concerned for those people and communities in the path. Closer to home, we're in the last two days of rest before the tour - and enjoying every minute. we're in the cottage now - and loving it!! Feels like a real vacation. so now the main house is ready for the renovations. Really more reparation....but it means kitchen disappears. and so do we. Lise, Donna and Deanna came on Tuesday and packed up. tony helped move furniture. Del and his guys were also there, removing three trees. Then Wayne showed up to cut the grass. It would have been bedlam - except we all knew what we had to do and did it. It turned out to be hugely fun. Who'd have thought it? Honestly, thank God for Lise and Donna and Deanna. Sent untold numbers of boxes to the church for their sale...to be honest, I'm not certain which church, but if there's one called Our Lady of Bad Taste, then that's where the stuff ended up. Amazing the things we found at the back of cupboards. And then to have Lise or Donna pull it out and hold it up. I insisted the worst of the stuff were gifts - but I think they knew better. By four that afternoon Michael and Trudy and I were in the cottage next door. It was like sneaking away and finding a bit of peace and quiet. As I said, like a vacation. We sat on the balcony, had a ginger ale, and took a photo for you. This is our new view. Hard not to relax. This cottage has another advantage...or at least did...there was no internet. I was shocked how serene it felt. We could still get emails on the blackberry, but couldn't access the internet. Now, just before going on tour isn't really the best time to lose internet, so Michael arranged for something called the Hub from Rogers. And magically, we're back on line. But it taught me that being without internet is not one bit stressful. Just the opposite. However, having found the high road, I am now skidding back down and happily playing in the land of Wireless. Had friends Margaret and David over here to the cottage for dinner last night. Felt like a house-warming. Tony lit the fire for us (I was afraid squirrels or birds might have made a nest in the chimney, but it was all clear) - had mushroom soup, confit de canard, wild rice, and banana cream pie. Yummy. Hoping to have a couple of quiet days - then off on book tour. Hoping to see you. It's a very exciting, but enervating, period in my life. Just before the new book comes out. Life is filled with potential. Anything can happen with the book. I'm free to dream. Imagine all sorts of wild successes. Fabulous reviews. Wonderful events. To imagine your reaction. But my fears can also slip out and grow. Mostly though I'm just very excited A Trick of the Light is almost in your hands. I sure hope you like it. Between us? I think you might. A cold front and storms swept through last night, and when they left they'd taken our summer, and a remarkable man. Jack Layton died last night - he was 61, and the head of the official opposition in Canada...the leader of the New Democratic Party. He'd led them to a historic victory in the election this past winter. And then, in July, announced he had cancer and was stepping aside temporarily. I think most of us who saw that news conference suspected the worst. He no longer looked like the vital, robust, fit man we were used to seeing. His voice was hoarse and he looked frail. And now our fears are confirmed. Oddly I woke up this morning wondering how he was doing, but it wasn't until I stopped by La Rumeur (the bakery in Sutton) that I found out he'd died. Very sad. Now, he was no saint, not savior, no divine being. But he was a man of conviction, who held to his beliefs and managed to navigate the murky, unpleasant, waters of politics and still keep his integrity....and the respect of his party and followers. And many others who would never, ever vote for a social democrat, but who admired the man. An unexpected and beautiful day. Was supposed to rain - storm even. but so far it's been gorgeous. And - to make it an even better day - we have an Abercorn Bakery lemon meringue pie in the fridge. If you're in the area there are two bakeries you must try to drop by - the Abercorn Bakery, in the village of, yes, Abercorn. It's just across the border from Richford, Vermont. and, in Sutton, the magnificent La Rumeur Affamee. Which has baked goods, but also has the most wonderful selection of cheeses, and meats - and sorbets. And if you like date squares....well - their dates will get you to third base in no time. they're obscene. We zipped across to Richford, then to the bakery, then to cowansville, then to Knowlton for lunch - then home to meet Johnny and his son who came to take the rusty old clawfoot tub and a sink out of the basement. then Tony arrived to get the ten year old paint tins out of the basement and take them to the toxic site. Ugh. We're convulsing with activity here. I'm trying to organize the kitchen into three sections...a sort of kosher construction project. There're the things we want to keep. The things we want Kirk to sell (nice glass and plates), and the things we want to offer to friends (good things, but not necessarily collector's items, just good, sturdy kitchen wares). And then there was the shocking amount of stuff that just got thrown away. Out of date food, opened and stale stuff, broken wares. Honestly - it's very humbling to clean out an old kitchen and see all the stuff that just got shoved to the back. How did we end up with so many mugs? And glasses? And those little ramakin things. How many does any family need? Probably none - which is what we'll have after this renovation. And measuring cups. Dear lord, if this was my next-of-kin cleaning it out they'd think their Aunt Louise was barking. for a woman who barely cooks, how come I have two dozen ramakins and at least 5 one cup measuring cups? And three meat thermometers. And no tupperware container matches the pile of tupperware tops. I also have at least thirty cookbooks. but, to be fair, I use those a lot when writing the books. I'm surrounded by cookbooks and poetry books. And pastry. And cafe au lait. Dreadful, the life of a writer. Wheeled the recycling container to the curb yesterday. it was overflowing. Only to realize an hour later that it wasn't the week for recycling. So I wheeled it, bouncing, back....and Lise, God bless her, and Donna went through it and found all sorts of useful things I'd decided in frustration to recycle. I'm actually at that stage in life, and in the renovations, where I want to keep so little. Michael. Trudy. A good book, a fireplace, a nice cup of coffee or tea. A La rumeur date square sometimes. A bathtub. A Queen bed, so we can cuddle, but also have our own space. A laptop to write with, and a notebook and pen. the complete works of Auden. And knowing that the people I love are healthy and happy and safe. That's what I need. who needs a ramakin? or 24? 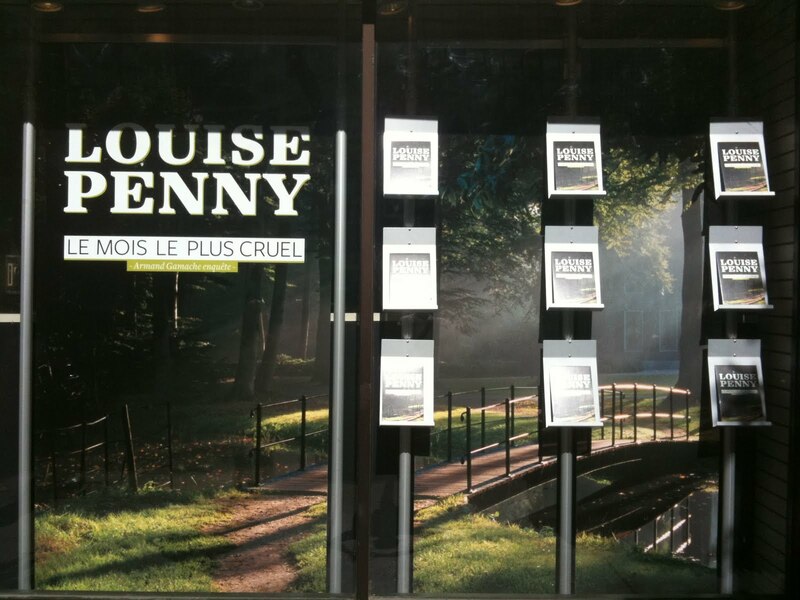 Oh, I wanted to tell you that my terrific Quebec publisher, Flammarion, has put Le mois le plus cruel(book 3, which is just translated and published in French in Canada) in the front window of the two major bookstores in downtown Montreal - Chapters and Indigo. Our great friend Dom took this photo of the Indigo store window today and sent it to us. Isn't that a fabulous image in the window? I'm stunned. And thrilled. Thanks, Dom! Now that's what else I need - kindness. And love. Finding lots of both these days. Makes it so much easier to downsize things. A really fabulous day after torrential rains for the last few days. Yesterday was supposed to be sunny, but the forecast quickly changed to rain and storms...and there they were! But Michael and I still had a magnificent time. We got up just before 6am...fed and walked Trudy - Pat came to house sit - then we jumped in the car and headed to...hovey manor!!! 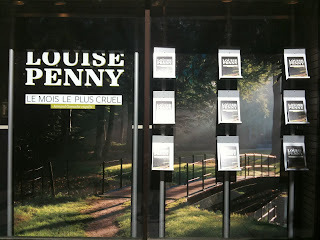 I'd arranged for two meetings there - a lunch with the film production people, who were coming from Toronto to discuss the project - and a photo shoot with the Journal de Quebec for pictures to accompany an article on the release of the third book in French - Le mois le plus cruel. Since both were happening at Hovey - a day apart - well, what's a gal to do? We took the cheapest (clearly a relative term) room in the house...the small room right behind the library. Room 1. We were actually offered an upgrade, but we just fell in love with the small room with the ginko wall paper and bathroom so small the sink was in the room itself. But two big windows looked onto the garden and across to the lake. And it was cosy. Met for lunch with the film people. That's us in the photo. 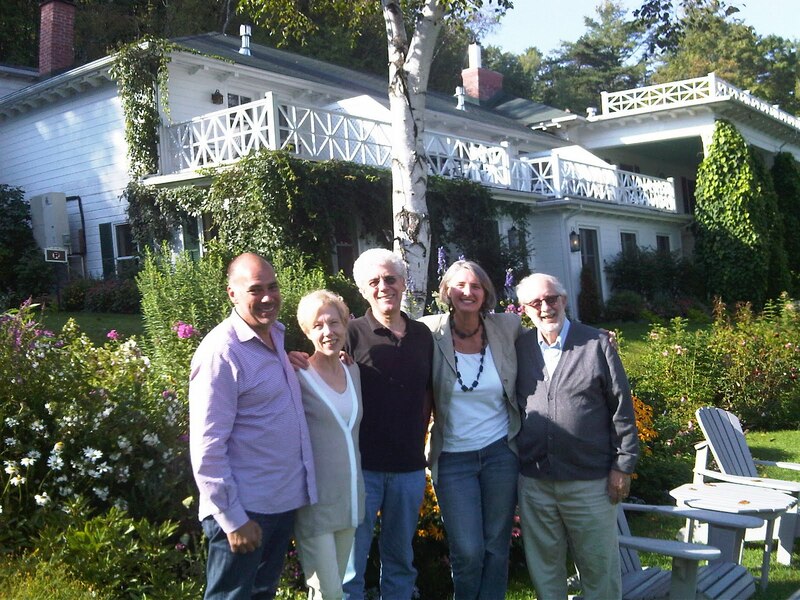 Brian, Phyllis, Peter, me and Michael. I'm being intentionally vague about the films only because so many things can go wrong with these things, apparently. It's all new to me. What I do understand is that far more film options are sold than films are ever made. The plan here is to turn the first two books, Still Life and Dead Cold into made for TV films. And to have them distributed internationally. So we got together, had a wonderful lunch, and talked about how films get made, the priorities, the stages, the decisions. We didn't discuss casting - at least not specifics. I find this whole thing fascinating. As you know, I declined all film and TV offers over the years because most wanted control of the characters, or I didn't think they really 'got' what the books are about. But this film company seems fabulous. Interested in making a success...but also interested in making sure the films really do reflect in every way, the books. The settings and characters...but also the feel. Then, late afternoon, they headed back to Toronto and we hunkered in for a marvelous hovey dinner....scallops for starter and duck as the main course. Michael had Quebec strawberries, ice cream and frozen basil as a dessert - and I had a selection of sorbets. Then into bed in our tiny, perfect room. Today the Journal de Quebec photographer came by Hovey about 11am. The Journal wanted a photo in a place that inspired the bistro in Three Pines. Since it really doesn't exist, the closest I could come was the big walk-in fireplace in the dining room at hovey. So that's where we shot. Then scooted home. SO much to do to prepare for the renovations and the book tour. Yikes. tomorrow the world arrives - Tony to move some of the stuff we've decided to sell over to Kirk and Walter's. Johnny and his son to pick up the old clawfoot tub and sink in the basement. Cameron to pick up the squeaky kitchen table to repair and keep during the renos - and to see about making a kitchen island. M. Tetrault to pick up the sofa bed and chair to be recovered - and keep during the renos. Bob and the construction foreman to walk through what needs to be done. Speak to you soon - hope you're thriving!!! Amazing line of storms and heavy rains. Never seen so much rain - it's incredible. Lost power briefly - we've had more violent rain and wind, but none that lasted for two hours. Terrible to see that grandstand collapse in Indiana. On the other end of the weather spectrum the moon was so bright the other night it woke me up. It was as though someone was shining a floodlight into our home. I walked around looking out of every window - at 2am- just to be amazed by the light and strong shadows, and to see if I could see any animals out in the bright fields. Busy day yesterday - lots of socializing. I find I can't take it as happily as I once could. I like people, a lot. But I also like quiet time, and privacy. That's one of the huge blessings of these quiet days in the country with Michael and Trudy. No writing. Few interviews. Just breathing, and reading, and lazy days together. And some socializing. I owe time to patient friends, but I have to say, right now, I just long for quiet. No voices. Gathering quiet, before the tour. Book tours are amazing. Very exciting and invigorating - huge fun. But not peaceful. So I gather up the peace and calm and energy, so I have lots to spend on tour. But still, we're spending some time with friends...huge block party at Guy and Nicolle's yesterday. dinner with our friend Louise. Brunch today with Susan and Liz. This coming Tuesday we're meeting the film producers at Hovey Manor for lunch, to discuss turning the first two books into made-for-TV films. Very fun - but so much can happen to mess it up! But fun to imagine. And this is our first 'summit' meeting on the films. Then on Wednesday, also at Hovey, I have a Journal de Quebec photo shoot. Speaking of French - the third book has just been published here in Quebec in French. It's called Le mois le plus cruel - a direct translation of The Cruelest Month. If you're in Quebec, please tell lots of people about it! Be well - and speak soon! Much cooler today - but when the sun does come out it's again quite hot. Longing for a bath, but Bob is coming by with the plans for the renovations so best to be dressed, I find. Lise and Donna are here, doing the gardens. 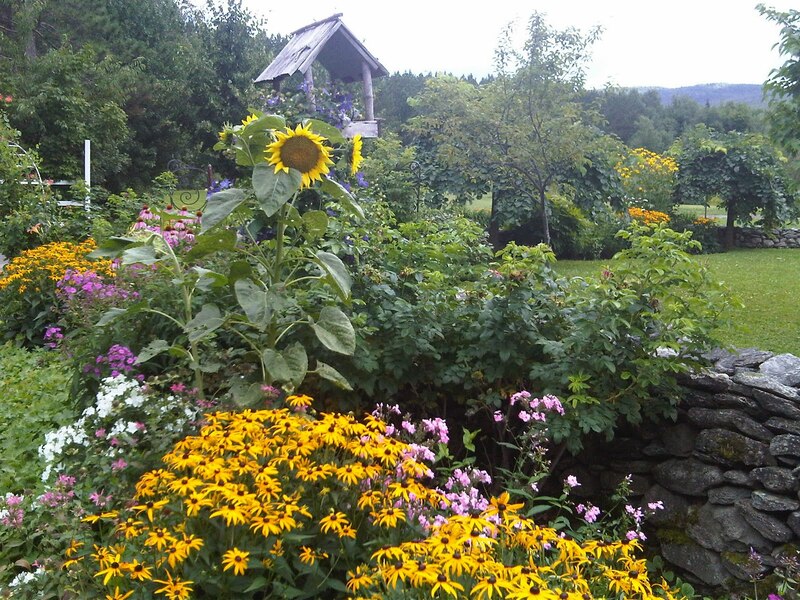 Magnificent year for the flowers and the vegetables. But then, Lise and Donna could make a mud hole attractive. The sunflowers this year are outrageous. You can see one of them in the photo....the sunflower seeds fall from the bird feeder in the winter and spring - and some germinate and voila! We leave them up for the birds to eat later in the summer. Did I tell you that the nice trapper man said he can't relocate the porcupine because it's against the law in Quebec to disturb its habitat. I guess if we were going to put up a house, they'd let us relocate him, but we aren't....just want to get him to a place far away from Trudy. I didn't realize porcupines are endangered here. How tragic is that? I guess it's because of development - and people simply shooting them. So our guy is welcome to stay - we'll just live around him. So far we're very lucky that he hasn't come onto the main property, but stays at the guest cottage. We're moving over there when the renovations begin, so Trudy will have to be walked on a leash, and Gary (how wonderful) is building a gate for the verandah, so we can sit out there with Trudy and not worry she'll run off and get quilled. I actually love the thought that we can keep the porcupine safe...at least, safe from us! And us safe from it. People have been asking if book 8 has a title - beyond "Book 8". Yes, it does - at least, a working title...I i'd like the team to read the book and discuss it before I tell you...hate for the title to change from the one I tell you. It doesn't happen often, but it happens. but I'll let you know as soon as possible. Have been watching the riots in London with dismay...but then so gladdened to hear people are now organizing to clean up the mess. Love that. Reminds me of the reaction in Vancouver after the team lost the hockey finals and hooligans went on a rampage. it horrified that beautiful and dignified city. Never seen anything like it. And what did they do? After a day of rage and reaction people began to show up and simply, spontaneously, clean up. I find that sort of community action so moving. And powerful. Beautiful day. Breakfast in Cowansville....you can see the photo Michael took. 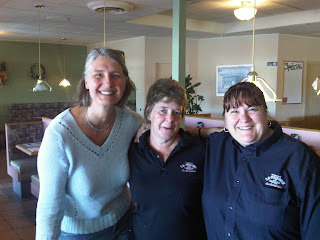 The woman in the middle is Jackie and the one on the right is Linda....both have become friends over the years. they work at The Station in Cowansveille, and every Tuesday for a decade we've gone in for breakfast - when we can. Same thing most of the time. French toast with sliced banana and strawberries. Yum. And now am off for a massage. Funny, one of the thoughtful comments on the facebook page was from a person in the UK and she mentioned their sudden and shocking shattering of the peace, with the riots. I've actually struggled with whether I should be mentioning these world events. Like that - like the famines - like the S&P downgrading and the fragility in the US economy that effects all of us. One of our prime ministers here in Canada once commented that when the US catches a cold, we sneeze. and I'm of two minds. Michael and I are clearly aware of all these things. But I frankly believe you are too and don't need me to comment. But I struggle with hoping I don't come across as not caring - or having a great view of my own colon. The woman who wrote wasn't chastising me in any way, just commenting on her own life. And I love that. And value that. And that's what I hope to do here. Not comment often on world events - though clearly I sometimes do - but really just talk about our own lives here. Our smaller struggles and joys. And one of the struggles is when to mention world events, and when not to. Perhaps one day I'll be comfortable with the balance I strike...but probably not. Hope you're well and thriving...and at peace. One of those funny sort of days where it's humid and cool. My body is confused - not for the first time. but my head and heart are in agreement!! This is a magnificent day! I finished the third draft of book 8!! I also want to just clarify that this is not A TRICK OF THE LIGHT - that was finished many, many months ago. books really have to be, since there're all sorts of publishing decisions that need to be made - like cover design, final edits, publishing date, advance copies, marketing.... so a book needs to be at the publisher almost a year before it will actually get into your hands. The book I've been working on this year - and finished the third draft at 5:30 last night - is the next one. Book 8. Which, god willing, will come out a year from now. Book 8 (do you just love the title?) is the one set in the monastery. Very fun, as it turns out, to spend much of the year with monks wandering around in my head. bumping into all sorts of unsavory thoughts. Poor ones. Of course, finishing the third draft doesn't mean they aren't still up there....whispering things I should have done with their characters - lines I could change - small edits, slight smoothing. Chatty for men who've supposedly taken a vow of silence. I've sent the manuscript - electronically - to my agent. This is actually the first time I've been able to do this since she now has a kindle. How things have changed! Up until now it's been all mailing of printed copies. I wonder what the next ten years will bring? I know it's a scary time for publishers and especailly booksellers. I don't have a kindle - have no need. But Michael does - he actually has a nook. He loves it for travel, but continues to buy and read printed books at home. so we've found a balance - an alliance - between the two. As you can see - most of the fiction never reaches the printed page, but squirrels around in my crowded head. I might have to put the monks to work, cleaning out up there. I think insecurity is just part of the package. I don't like it - but I suspect it's far better than being cocky, or taking it for granted I've nailed the whole thing. I think it's what makes me try always to do better. If I'm not vulnerable it means I haven't risked enough. haven't strayed from my comfort zone. Haven't opened up. And perhaps, don't care enough. This is only true of me. I'm not in anyway saying other writers/artists/performers who are confident haven't risked, or opened up. I'm sure they have, and still manage to be confident. But after all this time, I realize it's just who I am. Not a good thing or a bad thing. Just a fact. And I can laugh at it now and make some peace with those insecurities. and vulnerabilities. But for today - life is amazing!!! Book done - and trying to have a day with nothing on the agenda except what I want to do. Oddly, that often means I'm quite productive. Little things like throwing out the old flowers and getting into the garden to make new arrangements. Calling animal control to see if they can live-trap the porcupine and relocate it deep in the woods. There're some details - like making notes of power outlets - for the construction. 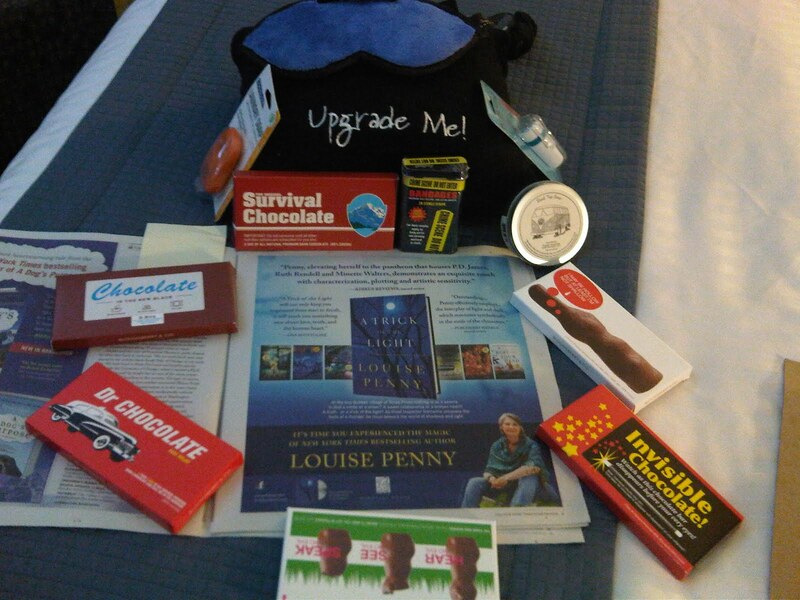 It happens when I'm on book tour. It's just nice to have one day when I'm not being told I have to do something. but do it because I choose to. What a surprising and blessed life. Made all the better for starting something difficult. And finishing it. Once Teresa reads it she'll send the book to my editors, Hope and Dan in NYC and London - and they'll make their notes and tell me what they think. so this is far from the last draft. But it's as close as I can get, and now I need their thoughts. When the team is great and healthy and collaborative and mutually respectful, this is a simply sublime experience. And I'm extremely fortunate in the team. I can hardly wait for you to read A TRICK OF THE LIGHT - about Clara's art show. Less than a month now!!! Hope you're enjoying your day. We're all hoping this holds until after the annual SPCA fundraising tea this afternoon. It's over at the Bresee farm - they're also a vinyard and make lovely wines, apparently. We've bought some of their free-range beef. What a difference that makes...wow. Last year Michael and I hosted the SPCA tea - while of course volunteers like Lise and Kirk and Walter and Cynthia and so many others, did all the work. We just swanned around and got all the credit. it was perfect. But a nice day makes all the difference...so far, so good. We got wonderful news from the american publishers, St.Martin's Press/Minotaur - in the lead-up to the publication of A TRICK OF THE LIGHT they've decided they want to bring as many people to the series as possible, and preferably start with the first book. so they've discounted the eversion, to 2.99. Obviously, this is for a fairly short time - probably a month, perhaps slightly longer. I know many of you, perhaps all of you, have already read Still Life, but if you know someone who hasn't and is perhaps hesitant, this might be their chance to buy in cheap, and see if they like it. What I love about this is that I feel very strongly that the series is better if read from the beginning. It's not necessary - I really try to write each book so that it stands on its own...but I know it's just more fun if you follow Gamache, Beauvoir, Clara, Ruth et al from the beginning, and see how they're changing. I really appreciate the publishers doing this - I hope it does bring lots of new readers on board. Had a very fun day yesterday. Got up early and headed the hour or so to Manoir Hovey for breakfast...poached eggs on a bed or arugula and leeks, with a bechemel cream with goat's cheese - and smoke salmon. Dear Lord. Then we went to Sherbrooke - a city about twenty minutes from Hovey - to pay off the gas fireplace we're having installed in the autumn renovations. The propane supply company made us give them the names and contact info of two close relatives, who don't live in the house. This didn't speak highly of their confidence in their product. 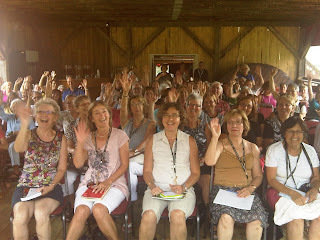 Then we went off to Eastman - which is this lovely village in the townships...there a woman named Nicole nine years ago started one of the most successful French literary festivals in Quebec. It's called Les correspondences d'Eastman. This was the first year i"d been invited because it's the first year any of my books is available in French. I was on a panel with two other Quebec crime writers - Johanne Seymour and Andre Jacques. 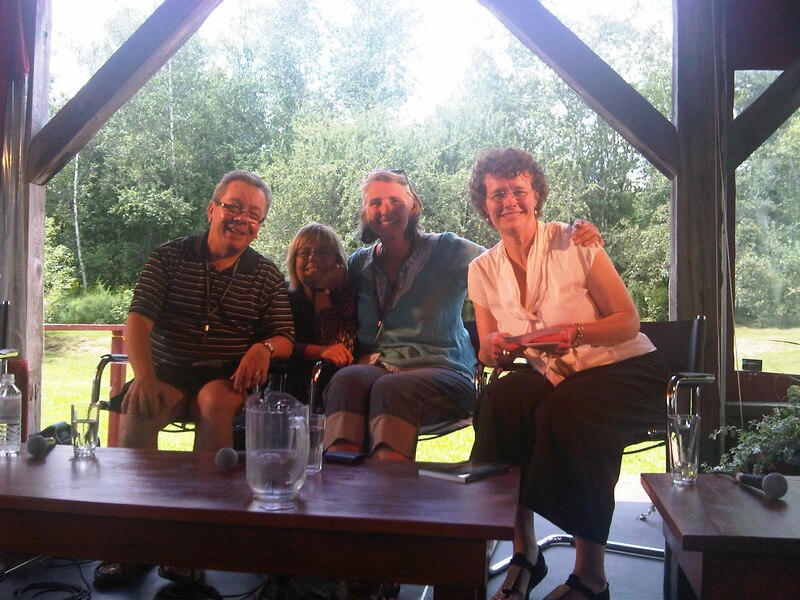 It was moderated by a former colleague, and a friend, Anne Lagace-Dowson. I was more than a little worried that my french would fail. I never really know, at these things, if it's a 'good' french day - or a rotten one. I find it's often difficult enough to describe what my books are really about, and my thoughts on writing and crime fiction, in English. In french it's a potential disaster. I felt I should give the organizers the names of two close relatives, not in the audience. In case. Well, it was terrific. Everyone was very kind and helpful - especially Anne and my fellow panelists. And the people in the audience listened with great patience as I tried to work out what I wanted to say, and how to say it. Before the panel began, I took this photo of the audience. Don't they look lovely? And then a nice woman volunteered to use my blackberry to take a photo of us. Andre is (obviously) on the left, then Johanne, me and Anne. Then we drove a neighbor who was having trouble with her car home - and got back in time for a lovely swim....ahh. And then we fell into bed and watched a Poirot while shelling peas from the garden and eating them, along with tiny tomatoes and radishes - and peaches from Ontario. We woke up to find tiny peas rolling around in the bed. No princesses here - we both got a sound sleep. Am now washing the sheets, though. I see that Amazon now seems to be accepting reviews of A TRICK OF THE LIGHT. If you've read it, and liked it, please post one! If you didn't like it - never mind. Thank you! Hope you're enjoying your weekend. You can tell that we've slipped over the cusp of summer here. As soon as August starts. We can still get a very hot spell, but for the most part it begins to cool off. We now have a harvest of potatoes. Two. Our counters have also moved up three two feet or more as all the food has been lifted off the counter and is now piled on top of the fridge. this comes from Buttercup experience. 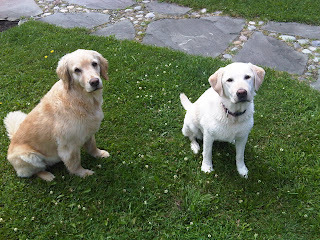 She's the dog on the right of the photo - with her," I'm thinking" look...Trudy is on the left, with her "I'm not thinking" look. They're such great friends. In fact, Trudy completely dumps Michael and me when Buttercup, Charlie and doug are here. she slept with them last night - which means Charlie was the one who got the soft, smelly, toy in the face at 5am. But there's no doubt that buttercup rules. She wants in. She wants out. She wants all the carbs in the house. She swims on the pond, rolls in skunk poop and eats the goose droppings. She thrusts her head in places that make us jump (and it's often a wet head, so you can imagine what we all look like when we go into Sutton). But she is absolutely joyous. Doug had warned us that at 8 and a half she was slowing down. We see no evidence of that. We're having a great time. I continue to edit all morning...have moved a TV table up to our bedroom, along with the laptop. 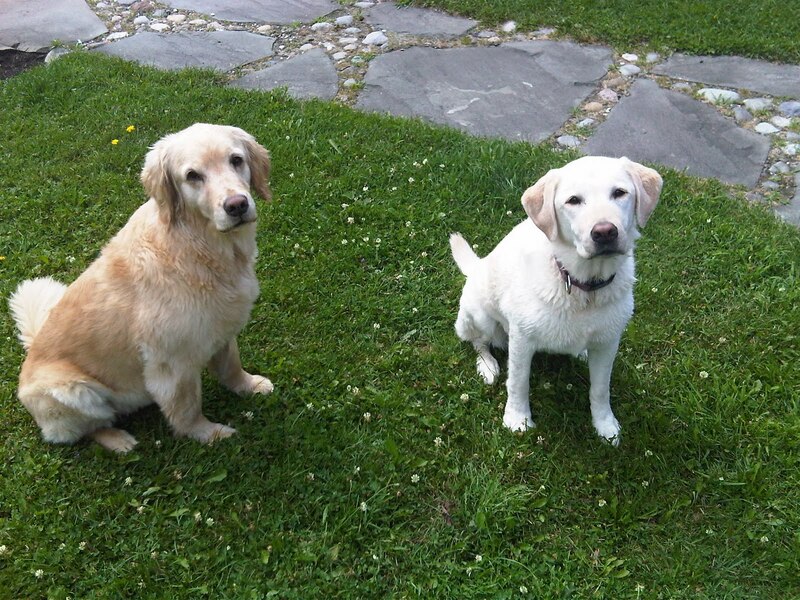 That frees up the rest of the house for Charlie and Doug to play/swim/chase Buttercup. Am finished by one o'clock. We grab lunch, then the guys go golfing (a par 3 close to us) - and today Michael and I are off to meet them in Sutton, for ice cream cones. Wanted to tell you that on Friday I'll be doing an event as part of a terrific local literary festival called, les Correspondances d'Eastman, in Eastman, Quebec....a pretty village in the townships. I'll be on a panel with Johanne Seymour, Andre Jacques and moderated by Ann Lagace Dowson. It will be in French. the panel is at 1pm. Michael and I plan to start the day with breakfast at Manoir Hovey - then off to make final arrangements (sounds very somber) for the new fireplace for the renovations - then head to Eastman for the panel. Love to see you there! Les Correspondances is a really amazing literary festival - varied - great balance of genres and between established and emerging writers. Must run. And still in my pajamas! Best, perhaps, to at least put on my good pajamas for the trip in to town. And still have to put laundry on the line. Oh - and the third edit is going very well....what a relief! am now at page 155 of 285. And very much liking the book. Changes still being made, but they're superficial at this stage. simplify. simplify. Hope to be finished this edit by Sunday.